Just before the July 4th weekend a small package arrived in my mailbox. A small package, but a mighty player within (that’s what she said)! 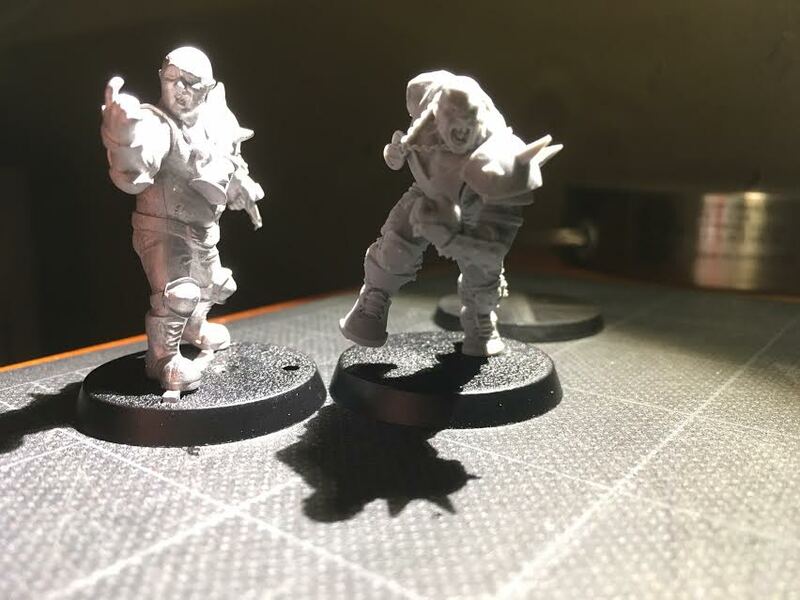 Our friends over at Tursas Miniatures sent us one of their custom Mighty BeerBeer miniatures to review here at Wyrd Stones and Tackle Zones. The mini was produced as a Blood Bowl tournament giveaway to participants in the Helsinki, Finland, area. Designer of the mini, Lassi Warsta, created the design in the free 3D program Blender and wrote about the process of creating the miniature and getting it cast on his blog. If the blog post seems a bit technical, that’s probably because Lassi is an engineer. Still it’s an insightful read and makes me curious about learning Blender myself … right, as if I don’t have enough on my plate as the father of two young kids, working full-time and the co-commissioner of my local Blood Bowl league. Enough chat, BeerBeer me an unboxing! As you can see in the first image of this post, the Mighty BeerBeer comes in a plastic clamshell with a printout insert with an example of the painted miniatures. The mini itself comes in a small bag. And it includes a base! How novel. The front of the mini … hey wait that mini has a tab! But the base doesn’t have a slot! Ah, that’s fancy. The base has an optional slot. And holes for pegs. The hole looks too big to fit the new fancy BB balls, but would work for minis with pegs instead of slots. Check out all them angles! The Mighty BeerBeer is a very nice looking mini. It’s cast in one piece so there’s no assembly. The details are pretty minimal but are nice. I noticed what might be a slight miscast on the chain that holds his beer mug. The mold lines are very minimal, but it did go down his right eye. As you can tell from these comparison shots, Mighty BeerBeer is one big dude! Originally I was hoping I could use him as a Mighty Zug for my 3rd edition plastic team. But as you can see he dwarfs the 3rd ed human on the right. Mighty BeerBeer was obviously sculpted with the intention of fitting in with the BB16 release set, and for that team he works great. As a ST5 star player his size is just right. Unfortunately I don’t have one of the new Forge World Zugs to compare him against, but if BeerBeer travels with me to Austin at the end of the month we can compare him against Mike’s FW Zug. Yeah, he’s as big as a 2nd ed ogre … that’s not going to work for my 3rd ed humans. Overall, I’d say Mighty BeerBeer is a cracking first effort from the sculptor and Tursas Miniatures. I really like Forge World’s Zug, but BeerBeer is an excellent and cheaper alternative. At 11.50 euros with free worldwide shipping, he’s an absolute steal. Order yours here. Disclosure: The MightyBeerBeer was sent to me by Tursas Miniatures free of charge for the purposes of this review. This entry was posted in Blood Bowl, Gaming and tagged Blood Bowl, Fantasy Football, Games Workshop, Mighty BeerBeer, Mighty Zug, Star Players, Tursas Miniatures, Unboxing, Warhammer by caseyrog. Bookmark the permalink. Nice! Thanks DoubleDownDice. He looks appropriately sized with the FW Zug. I like the new Zug model but I think I will go with Beer Beer instead. You’ve sold me Casey! Nice write-up. Awesome! Thanks for the pic!